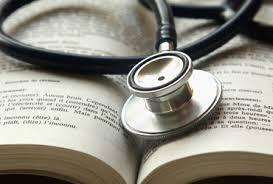 I need a book doctor. If you haven’t heard that term before, a book doctor is someone who will take a presumably moribund manuscript, put it on a strict regimen of big picture prescriptions – a look with a tongue depressor down the throat of the thing, shining a light there to see about improving development, structure, organization, and flow. The closer, more surgical examination to get at finer, more granular line edits can go to an editor or proofreader. A book doctor looks at the macroeconomics of these created worlds. Writers and 50-something women are extremely solitary and independent sorts not easily convinced that there is anything that ails us that a good cup of manzanilla won’t cure. Well, unfortunately for me, just now, not even a trusted curandera can remedy my malaises with chamomile, Pepto, or mentolato or the soothingly mesmeric mantra “sana, sana colita de rana.” The storied egg cure will yield its inevitable yolky mysteries, and the limpia would be better left to other dreads. I’m talking about my novels. I’m always talking about my novels. All of them. They each require a specialist. 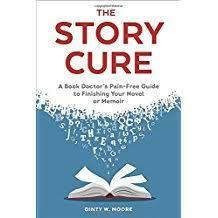 Right now I need The Story Cure: A Book Doctor’s Pain-Free Guide to Finishing your Novel or Memoir by Dinty W. Moore. Yes, that is his real name, and most writers know him for the remarkable Brevity: A Journal of Concise Literary Nonfiction, an established and renowned online journal of essays and book reviews. You can find everyone there from Pulitzer and Pushcart Prize winners to NEA recipients and authors from the “Best American” series of books. Moore is the longtime director of the writing programs at Ohio University and an all-around writing guru. Even with all of these lives, Moore manages to write his own nonfiction and his own books about writing. So this prolific author is a physician who has healed himself – The best endorsement for any book doctor. Some writers renounce books about writing, finding them to be pointlessly pedantic, bereft of any salient advice on how to assuage the most basic problem most writers have – a paralyzing anxiety that what they have to say doesn’t matter. It’s an epidemic. From the outset of the book, in the very first chapter, “Diagnosing Problems of the Heart,” Moore encourages the writer to find the “heart” of the story. I also mostly disavow books about writing, though I’ve read more than my share of them. However, with this simple, sympathetic prescription, Moore gets to, well, the heart of the problem that plagues writers. Writers write, but writers also do other things, follow other vocations or jobs, take care of families, pay bills. They also get sick. It’s easy to lose the thread of the story we most want to tell. Each chapter offers a series of possible prognostications and cures. 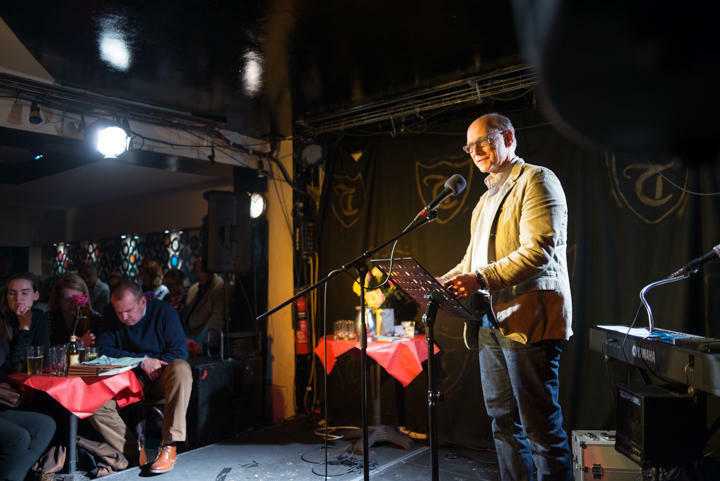 Moore uses case studies from classic and contemporary writing to make his point, citing examples from everyone from Charles Dickens to Joseph Conrad to Cheryl Strayed. Subsequent chapters cover a litany of vulnerable and susceptible organs of the whole book – elements like beginnings, character, dialogue, setting, sensory detail, voice, point of view, plot, and structure. The first half of the book is dedicated to ailments and their concomitant cures, and the second part of the book is devoted to what the good book doctor terms “checkups,” taking us through deft and definite revision processes for good maintenance. He also offers up suggestions on “healthy” writing habits. Writing – and sticking to a project – just isn’t an easy prospect. And it’s one that will never come with instantaneous rewards. That’s true about good health and wellness, too. But the more you stick with it, even if it’s just because you’ve been momentarily spurred by some solid, inspiring advice, the easier it is to find your way back to the heart of the story and why you started it in the first place. Most really good writers I know work hard at their writing and do it because they can’t not do it. And who are we anyway if we’re not telling stories and getting at the deeper meaning and truths of our lives? When I’ve been down with the maladies that afflict me, I’ve found myself climbing up to better health I just don’t take for granted. I take good care of myself. I’m reasonably active, watch what I eat, and fend off vices, but the wear and tear of time marching on isn’t easily stemmed in spite of my best preventative measures and practices. Genetics, the environment, and the lack of accounting of earlier foibles – well, you just never know. I do know I want to be around long enough to share the stories about the U.S.-Mexico border – a place where too many mercilessly perish from preventable diseases, but that’s a subject for another commentary. I’ve read books and articles about health and fitness since I was a teenager. Today, I still might try a new eating or fitness plan knowing that – over a protracted length of time – I might feel better. Even at my age, I find that there is always more to learn about how to take care of my body and my mind. Similarly, I’m a writer and have been my whole life. I’ve taught writing for 27 years, but I’ve never stopped being a student of writing, and I never will. I have a story to tell that can’t wait any more. Why wouldn’t I down another glass of water, track another 10,000 steps on the gizmo on my wrist? And why then wouldn’t I read a book like the Story Cure? In the eponymous short story from the collection Interpreter of Maladies by the acclaimed Jhumpa Lahiri, the protagonist, Mr. Kapasi, is an Indian interpreter of maladies in a doctor’s office where the staff does not speak Gujarati, the language of the patients in this part of India. Kapasi doesn’t see the merit of his work, though, if you think about it, he has a job that is as important as the doctor’s. The irony of the situation is that he cannot interpret his own maladies, the poor communication he has with his wife, the lack of intimacy, his restlessness, his own ennui, and the causes of it. Even as someone who writes for a living, who teaches it and can think of little else, sometimes it’s difficult to perceive the pitfalls in my own work. There is such a thing as being too close to it, as being myopic even, and seeing the panoramic view of the forest and not a single tree. Antonin Artaud famously said that, “No one has ever written, painted, sculpted, modeled, built, or invented except literally to get out of hell.” Illness can be a literal hell. But so can a voice silenced by not writing. We write from our wounds – brandishing our story like a brimming salve – to reach the wounds of others. And so The Story Cure cures the story. 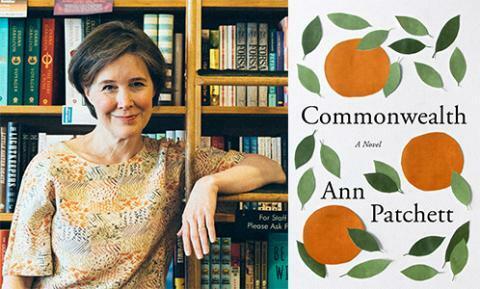 Best-selling author Ann Patchett is known for her works of fiction and nonfiction. Her many acclaimed works include Bel Canto, State of Wonder, Truth and Beauty, This is the Story of a Happy Marriage, and many others, including her latest, Commonwealth, her seventh novel, which provides a discerning, sometimes funny, sometimes heart-rending study of sibling and other familial relationships. Ann Patchett also co-owns Parnassus Books and went into the independent booksellers business when two other bookstores in Nashville closed. Writing can be therapeutic and reading makes us feel less alone--these aren't very original ideas but they bear repeating because they are so true. Fridays at 3 p.m., Saturdays at 6 a.m., and Sundays at 9 p.m.
-- How did measles, once eliminated in the United States, make a comeback? One congressman is using insensitive language and blaming immigrants for the recent outbreak. 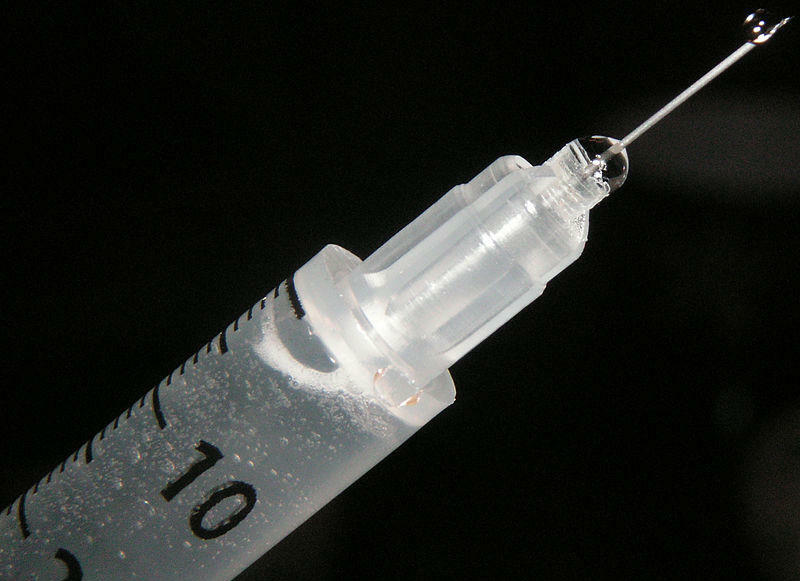 But has immigration really caused measles to return? Fronteras examines that concern and the loaded language that surrounds illegal immigration. Austin-based author, Elizabeth Harris, brings us the story of a woman who is the victim of a violent act. 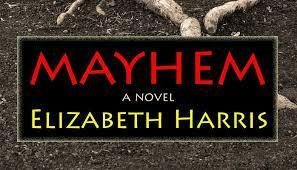 In Mayhem: The Three Lives of a Woman, protagonist, Evelyn Kunkel Gant does indeed live three lives. She is daughter, wife, and then, as a victim of sexual assault, a pariah—one who never receives any kind of compassion or vindication—except through the telling of her story. Elizabeth Harris takes us to the rural Texas of the 1930s—a place immersed in gender and social expectations that bring no sympathy to Evelyn.